Our Barn doors are designed and manufactured in house offering you a bespoke range of finishes and sizes to your door to suit your opening. With our barn doors being custom made for you, a lead time of approxmutily 2-3 weeks for your barn doors to ready. 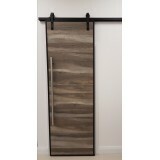 New for 2018 we bring you our exclusive Barn door range. The Tennessee Barn Door is designe..